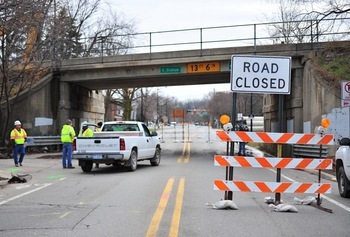 Posted on Thu, Feb 16, 2012 : 11 a.m.
A multitude of activities at the University of Michigan's athletic campus - along with the ongoing Stadium Bridges detours - will challenge Ann Arbor drivers on Saturday, the university is cautioning. South State no longer is temporarily closed for the Stadium Bridges work, which could help traffic congestion on Saturday. U-M is calling Saturday "one of its busiest non-stop days of athletic competition." As a result, the university is putting special parking regulations into place for Saturday's events at Crisler Center, Yost Ice Arena and other facilities between South State and South Main near East Stadium. The congestion will start before 7 a.m., officials project, and it will last through the end of the gymnastics meet, which begins at 7 p.m. Nearby neighborhoods - such as Lower Burns Park - already are bracing for the traffic increase, according to residents. Drivers already have been rerouted from East Stadium to South Industrial on the east side of the athletic campus and South Main from the west side. ESPN College Basketball GameDay will broadcast live from Crisler Center starting at 10 a.m. on ESPNU before moving to ESPN from 11 a.m. to noon. Fans can begin lining up at 5 a.m. The doors at Crisler (Gates A, C and D) will open at 7:30 a.m. Cars parked in the Lower Blue Lot without a men's basketball permit must be removed by 5 p.m. The meet is expected to finish around 4:30 p.m. Cars parked in the Lower Blue Lot without a men's basketball permit must be removed by 5 p.m.
Gray Lot: Available for ice hockey permit holders or cash sales ($10) starting at 2:30 p.m. Suggested Lots: Fans without an ice hockey permit are encouraged to park in the following University Lots — Coliseum (SC9), Elbel Field (SC38), East side of Greene Street (SC12, SC13, SC14). The Thompson Street parking structure will be available at 3 p.m. Shuttle from Thompson Street Parking Structure: A free shuttle service will run with pick up/drop-off locations on the Division Street side of the Thompson structure and outside of Revelli Hall on Hoover Street. The buses will begin running at 4 p.m. and will stop at 9:30 p.m. Parking: The normal lots surrounding Crisler Center and Michigan Stadium will be secured by 5 p.m. for permit parking. Fri, Feb 17, 2012 : 5:35 p.m.
Hmm, I guess I'll have to add 4 minutes to my bicycle commute time tomorrow. Hope all goes well for the motorized visitor crowds though. Track &amp; Field Invitational: Gosh, it's been 50 years since I first saw the inside of U of M's track and field building. That invitational was for high school teams. My first glimpse of Ann Arbor, as well. Love at first sight? Oh yeah.